Last year, at the age of 13, Jennifer made a very difficult decision. In 2018, she would drop out of school and go to work so that she could help her father and mother support her, her five siblings, and her precious nieces and nephews. Jennifer had studied through eighth grade, and she already felt incredibly lucky to have come so far. None of her siblings had completed middle school, and three of them had been unable to complete even primary school. Jennifer herself had been dangerously close to dropping out after the first grade, when her parents realized that they simply didn’t have the resources to continue paying for her education and feed their family. But her older brother, who had been working as a fieldhand for many years by that time, stepped in and offered to pay for Jennifer to continue studying. This time, though, things were different. Even with her brother’s income, her family was struggling, and Jennifer saw that it was her turn to contribute. She informed her teachers that she wouldn’t be returning to school in January and prepared to finish her eighth grade year. Luckily, neither her teachers nor her principal was ready to let Jennifer go. They excitedly told her that the Guatemala Literacy Project’s Textbook Program would be coming to their school the next year, and they reminded her of how drastically different her future would be if she completed her education, especially with high-quality textbooks. Thanks to their encouragement and Jennifer’s stellar qualifications, she managed to earn a scholarship to continue her education. Now, Jennifer is studying every day with those textbooks that motivated her to stay in school. She no longer spends hours copying as her teacher dictates or writes information on the chalkboard—instead, she is actively moving around the classroom, raising her hand, voicing her opinions, asking questions, and pulling her desk into a circle with her classmates to discuss what they are learning and put it into practice. In addition, Jennifer can tell that the quantity and quality of information she is learning has improved. Without a textbook to use as a guide, her teacher had an uncertain idea of what material to cover in class. 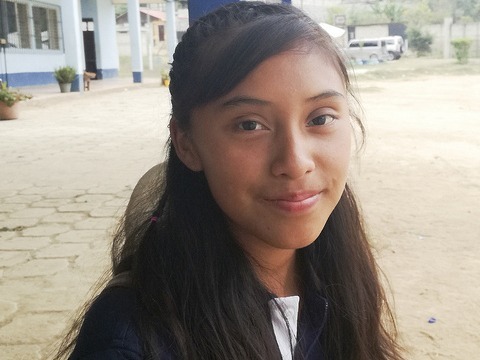 But since receiving the textbooks and attending training on how to use those books to achieve the standards of Guatemala’s National Middle School Curriculum, Jennifer’s teacher has found a solid base to teach from. The timing couldn’t have been better for Jennifer, who will need that quality instruction to prepare for high school and eventually college, where she hopes to become a licensed nurse and then a doctor. Though she still has a long way to go and her path forward is anything but guaranteed, she is excited to one day help others as a medical professional and to watch her nieces and nephews skip happily to school, with textbooks under their arms—the cycle of poverty broken beneath their feet. Ready to break the cycle of poverty in Guatemala?